Growing up I spent many afternoons cradled in the limbs of trees, through languid summers, shaded from the sticky Carolina heat. When I began drawing, at a young age, trees were my favorite models. I loved to imitate them on paper using charcoal or pencil, smudging and stretching the expressive branches across the page, each a portrait of a strong living thing that doesn’t speak but is a quiet witness to the world changing around us. 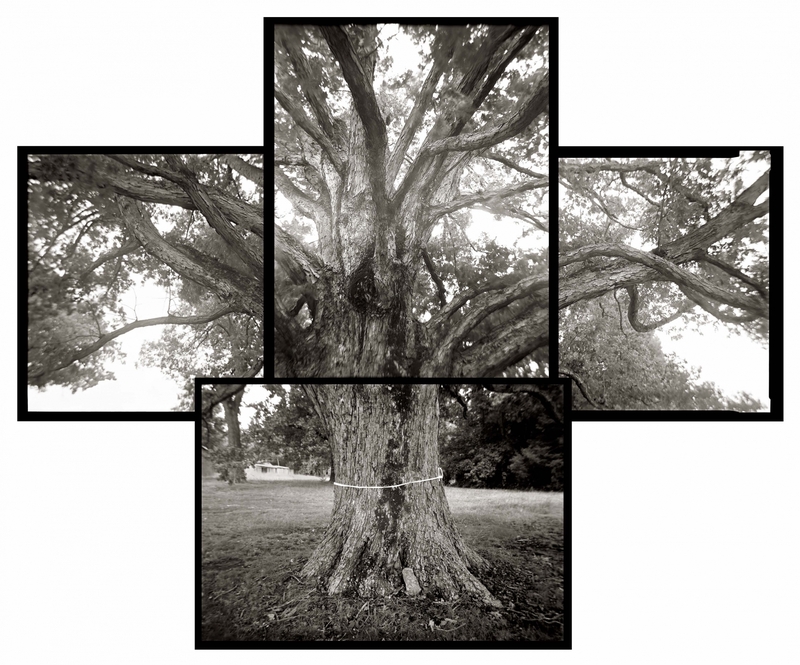 For over 10 years, I have been photographing trees chronicling the roots I have forged as an appreciation of the landscape where I call home. Through this work the trees are a reflection of ourselves personifying the passing of time, aging and mirroring life. I use 5” x 7” and 8” x 10” view cameras and like the imperfections of old lenses, and the history untold within them. But trees do so much more for us than provide a romantic notion, exemplifying human experiences, tragedy, triumph and the seasons of life. Their presence and beauty have been shown to reduce violence in neighborhoods in comparison to neighborhoods that are without trees. The shade from their leaves and branches cut down on the energy needed to cool buildings and homes in the summer. Their roots help filter the earth’s water. Their trunk, branches and leaves filter the air around us creating cleaner air. Trees take in carbon dioxide, convert it to food, and release the oxygen for us all to breathe. “In one year, a mature acre of trees can provide enough oxygen for eighteen people”. 1 I find this truly remarkable. It is an honor to be a part of this powerful exhibition and to share my piece Spared. The property around this powerful, great oak was being prepped for development, and with the white ribbon around its trunk, it appears that it has been spared from the bulldozer. To convey its height and depth, I photographed it with my old 5” x 7” camera, using four negatives, and pieced them back together. I wanted to portray the experience of standing next to such a magnificent, graceful living thing, revering its presence. The world around us is a better place when trees are surrounding our homes, businesses, and cities. They make the world a better place to live, not only because of their striking beauty and quiet company, but also because of their contributions to our every breath. “The Hidden Life of Trees: What They Feel, How They Communicate — Discoveries From a Secret World,” Peter Wohlleben. Quotes taken from The New York Times, January 29, 2016.